The Realm of Kingsburg is under attack! King Tritus has appointed you, his most trusted governors, to maintain and defend the border provinces from enemy attacks. To prosper, you must out manoeuvre your rival governors and persuade the kings advisers to assist you. Only one governor will ascend to the Royal Council, so gather your resources, construct your buildings, and prepare thyself - the future of Kingsburg is in your hands! 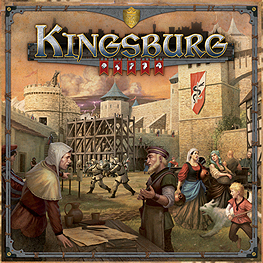 In Kingsburg, players influence the king's advisers to gain resources, develop their province, and defend it from ruthless invaders. After 5 years of governance, the player with the most prosperous province wins! This definitive edition of Kingsburg includes the base game, all five modules from the To Forge a Ream expansion, and a brand new module: Alternative Adviser Rewards. See what challenges await you in this exciting new version of Kingsburg! The artwork throughout is extremely good, the cardboard tokens are nicely done as are the wooden pieces. The supplied dice are nicely shaped and of good quality. The Main game board is quite large and easy to see and the various tracks make god use of artwork and icons to help guide you through the game. The rulebook is well written with good use of pictures and examples helping to guide players through each section of the game very well. Each player takes the role of a Governor vying for resources to build their provinces, military to help defend their realm and to win favour from the king. The game is played out over five years and the winner is the player with the most VP's at the end of year five. During the production phase the players roll their die and the player with the smallest total goes first in the playing order, the others playing in ascending order. They then use their dice to influence the Kings advisor's in turn until everyone has used all their dice or passed. Whilst reading the rules through on their own may make the game seem complicated, when read whilst playing through the first year it all falls into place quite well. This is a simple game to learn to play but one of those that will take a few games to learn some of the intricacies as there is a depth to this game not obvious from the simple mechanics. I found this game very enjoyable and with a few more games under the belt the game should play a lot quicker than the stated time.